The Asakusa neighbourhood of Tokyo draws visitors to admire the city's oldest temple, Senso-ji, founded in 628 AD with a quaint legend attached to it. The story goes that two young brothers fishing in the nearby river netted a golden image of Kannon, the Buddhist goddess of mercy, and the statue kept turning up in their nets no matter how many times they threw it back. The brothers were inspired to enshrine it in a temple dedicated to the deity. The statuette is still inside, but never shown to the public, though pilgrims flock here every day seeking the favour of the goddess. There are also numerous festivals associated with the shrine, and a hugely popular firework display is held on the Sumida River every summer. 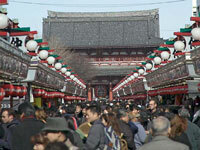 Tourists enjoy the visit to the temple mainly because the approach is a colourful pedestrian lane, Nakamise Dori, lined with shops and souvenir stalls. The area has become touristy but it is still a stronghold for ancient traditions and a wonderful place to do some people watching. For many tourists the temple is one of the highlights of a visit to Tokyo; the temple complex is usually bustling with activity and there is lots to see and do. Nearby, the Demboin Garden is a good spot to grab a break from the city crowds. Opening times: Main Hall: 6am to 5pm (from 6.30am between October and March). Temple grounds are always open.